Crossroads was quite an interesting novel, pretty different than a lot of the books I've read recently. A girl named Claudia Emerson can travel during her sleep to this place called Crossroads, which is basically like a limbo-land for people in comas and such. She catches the eye of a handsome young half-angel, and from then her life is never the same. 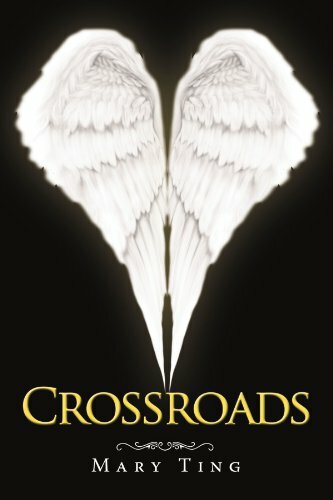 I loved the concept of the Crossroads, and the concept of the alkins, but I felt like some of the angel mythology was a little too stereo-typical. Like, there's a city called Halo City, and well, that just sounded like a bit too much. But overall, it was a really interesting premise. I definitely want to see more of the inner-workings of the angel hierarchy, and maybe meet some other alkins, or full-blown angels in later books! Character-wise, I liked Claudia, although I felt like she flew through so many emotions so quickly that it was kinda like "Whoa, there, slow down!" But she was kind-hearted and cared deeply for her family and friends, and very likable. The alkins, including the love interest Michael, were all amazing! I loved each of their distinct personalities! The only problem was there was some insta-love between Claudia and Michael. I would have loved to see their relationship build more gradually. They have an ultimate forbidden romance--the alkin can't fall in love with humans--so more tension would have been a delicious addition to the story. But still, Michael was romantic and loving, and I want to read more of him! The writing was really the only part that fell a little flat for me. I felt like there was quite a bit of telling instead of showing, and some of the dialogue felt stilted. Mary Ting definitely had a unique and descriptive writing style, I just feel like it could have been fine-combed and polished up a bit more. Overall, I give Crossroads 3.5 out of 5 stars! Oh, wow this one sounds really unique. I love the cover! Thanks for posting, I will add this one to my wishlist. I know, I hate it when the writing falls a little flat, too. It can definitely take away from the book. Thanks for the review! I may pick this one up in the future, but there are so many books I really want to read, it's not on the top of my list. Though it does sound right up my ally since I love angels.